People local to Maryland always seem to have their very favorite place to get steamed crabs. In our neighborhood, it’s Captain Trey’s. Not being a crab connoisseur myself, I can’t compare it with any other place we’ve gone to- but I can say their crabs are great! Their seasoning rivals Old Bay and you can buy it in bulk at their tiny shop. I also love the fact that Captain Trey is actually the one behind the counter, ready to answer any questions you may have. If you like, you can have your corn steamed with your crab order- which makes them spicy and quite good! Sometimes I feel a bit queasy about the whole destroying-a-once-alive-and-happy-living-thing thing, so I order a crab cake instead J I am not missing out, let me tell you. If anyone is going to make a good crab cake- it’s Captain Trey’s. I’ve never seen a crab cake have that much lump crabmeat! It’s insane! The flavors are great, as most crab cakes are, but what really makes this special is how much meat is in the cake itself. If you yourself are queasy about crabs- they do have a full menu featuring other items including subs and sandwiches. I’m pretty sure if you ask Dan though, he’d tell you to stick with the crabs- that’s what they do best. Thank you very much for the review. I'm trying Captain Treys for the first time tomorrow. Ordering a bushel large for my Dad. 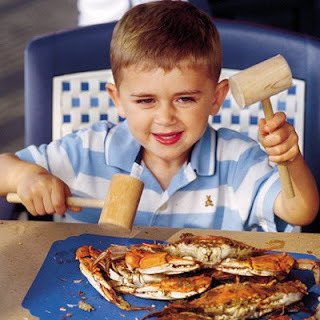 This Weekend: Old Bay Turns 70! June 10th, Free Kid's Meal at CalTort!